Church membership software and church accounting software by FlockBase are powerful, easy to use and specifically designed for use by churches! Access your data 24/7 from any device, anywhere. Streamlines everything from Accounting & Membership. Includes many new features like Online Giving. Church membership software from FlockBase tracks membership and contributions. FlockBase tracks membership, family information, contributions, funds, pledges, groups, and attendance. In addition you can easily print year end contribution letters, funds reports, family reports in text or photo format, and mailing labels. It is easy to organize your memberships with FlockBase. FlockBase is also designed to serve churches that depend upon volunteers. While FlockBase membership and contribution software is designed with the small church in mind, the functions available provide capabilities that large churches need as well. So, with No Training Required or seminars to attend. The easy to understand User Guide makes for immediate configuration. As a result, Church Membership software is a great alternative to complex and expensive church software. 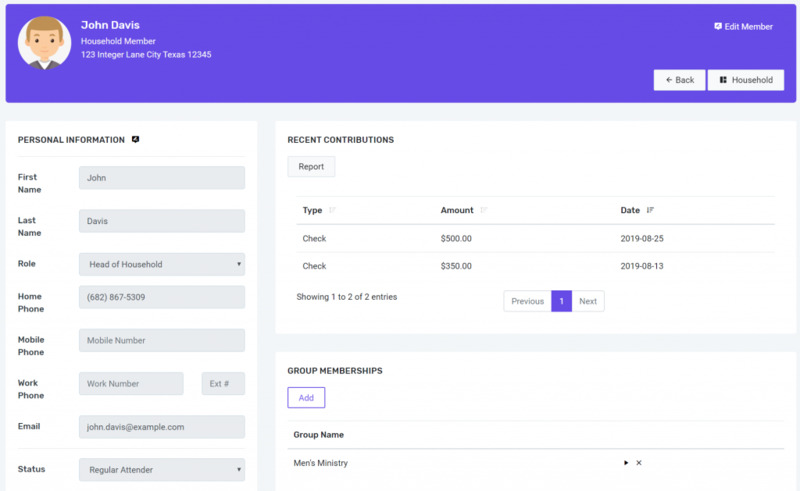 Church accounting software by FlockBase was developed by a CPA with more than 20 years of experience providing accounting services and consulting to churches. He realized that churches needed a simple way to track their funds, income and expenses. FlockBase meets your fund accounting needs! Although some popular for-profit software packages meet some needs of businesses, they do not meet the fund accounting needs of churches. FlockBase Accounting was specifically designed to meet the needs of churches like yours! Because no extensive training is required you can be using FlockBase Accounting within minutes. The easy to understand User Guide makes for immediate configuration. Finally, Church Accounting software is easy to use and makes tracking your checkbook, income, expenses, payroll and designated funds a snap.